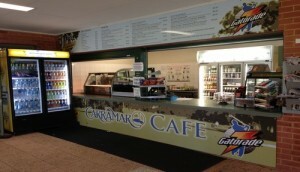 Carramar has a licensed café/ kiosk area which is the perfect spot to relax and enjoy a cappuccino or a cold beer or wine after the game while you overlook the 18th green. The café area seats around 40 people and there is also a popular verandah area to seat. The café sells a variety of tasty snacks and sandwiches as well as a range of popular beers by the stubby including Crown lager, Corona and Carlton Draught to name but a few. The coffee is the popular Dimattina brand and they also stock a large range of Schweppes soft drinks. Limited shower facilities are also available at Carramar. © 2012 Carramar Golf. All rights reserved.